Ross Controls, Troy, MI, will showcase its DM2 Series D size 2 double valve for control of clutch/brake mechanisms. The 100-percent dynamically monitored valve has complete memory, is control-reliable and Category 4 rated for press applications. Its dirt-tolerant, wear-compensating poppet design provides quick response and high flow capacity, and can be fitted with an optional status indicator. Use it on small gap-frame and die-cut presses, cylinder presses, small shears and on other small control-reliable pneumatic machines. For Category 4 control-reliable operation of double acting devices (including shear and cylinder applications), Ross offers its base-mounted Series 77 5/2 Crossmirror solenoid pilot-controlled double valves, constructed of stainless steel for long service life. Available in size 2, 4 and SAE size 4, the valves offer an optional pressure switch for external monitoring, providing for lockout and inhibiting further machine operation until the fault is corrected. 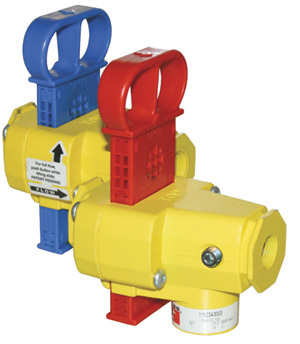 Also new: the firm’s latest additions to its safety product family–the Modular L-O-X manual lockout valve(shown) and Modular L-O-X with EEZ-ON operation. For flexibility, the valves can be mounted inline or as part of a modular assembly. The Modular L-O-X with EEZ-ON operation conveniently provides a soft-start function, allowing a gradual buildup of downstream air pressure before it opens to full flow. This function allows systems with cylinders, for example, to move more slowly and safely into their normal working position before full line pressure occurs, preventing unnecessary wear and tear.